I’m some three weeks into this new gig as stay-at-home-mom with all three kids in school all day. It’s a weird transition. I’m discovering that, as much as I enjoy puttering around the house, I don’t really want to be doing it all day. I’d like to be a flexible-work-at-home mom, but paid work isn’t exactly a faucet you can just turn on and off. Rome wasn’t built in a day, and I suppose neither is my resumé. What have I been doing between the hours of 8:30 and 3:00? I’ve learned how to update the website for a non-profit organization, written several blog posts, scanned some job listings, filled out an application, volunteered at school, and still tried to keep up with the regular stuff at home–laundry, dishes, meals, and the occasional bit of tidying and cleaning. I finally got my hair cut. I’ve only eaten one or two bonbons (stolen from the practice treat jar) and I’m decades behind on my soaps. 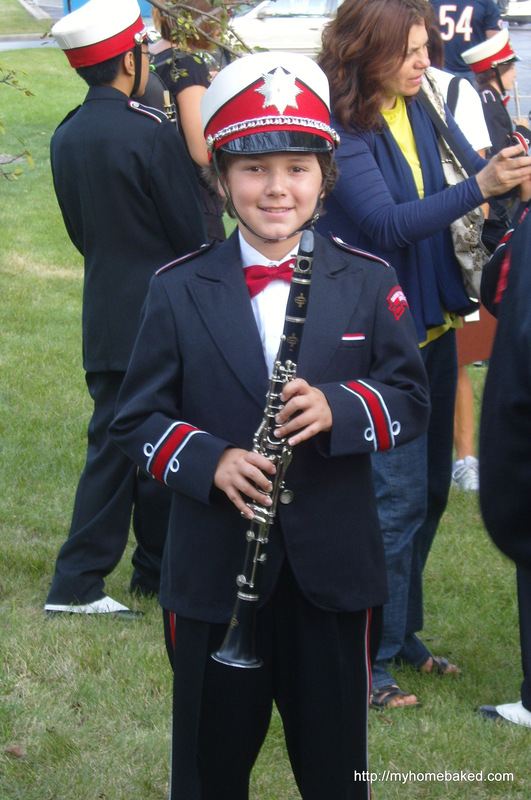 I did watch an episode of North and South while I hemmed Mr. Ten’s band uniform pants up a good six inches (by hand, without cutting anything off–the uniforms have to be returned at the end of the year). Kids in uniforms are so cute! 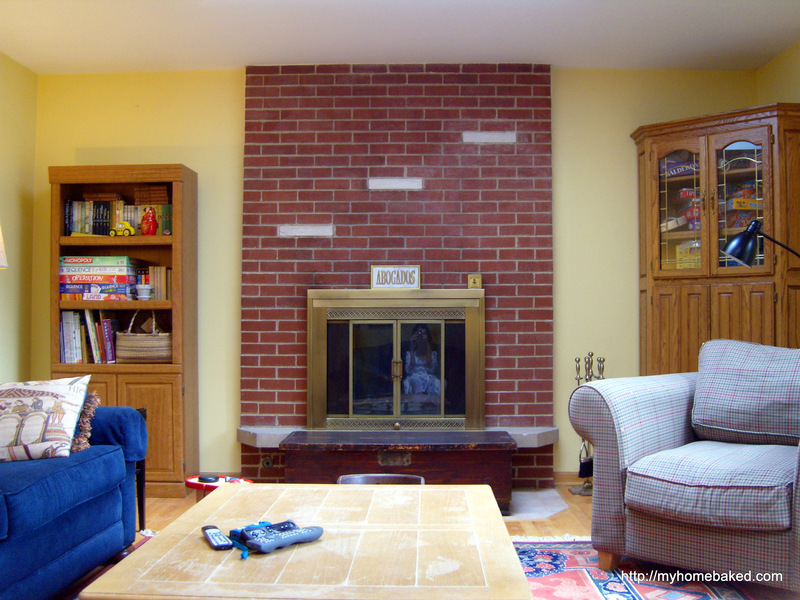 I have a host of projects I could work on–in the family room alone are three big projects: paint the fireplace, refinish the coffee table, and repaint the walls–but I confess, I haven’t gotten excited about tackling any one of them. I’m blaming this lethargy on the cold virus I’ve been lugging around for the past ten days. (Knock on wood, it may finally be on its way out. I slept through the night without coughing.) Yesterday I looked at the garage and thought, Ugh. I have to get started on this. Since Dad cut off the concrete shelves that so annoyed me, I can now prime, paint, and shop around for a nice big mantel shelf. In a minor effort to begin on the garage clutter and raise a little cash, I took photos and listed a couple items for sale on Craigslist. 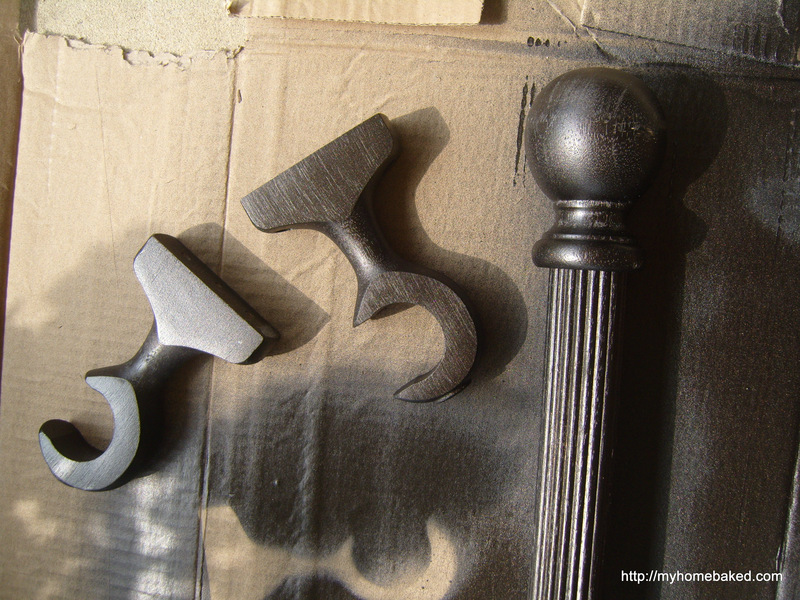 I spray painted a curtain rod (thanks, Freecycle! )–the one that has been propped up next to the refrigerator for the past month–for my bedroom. I even put the curtains in the wash. The old rod is now in Mr. Ten’s room. 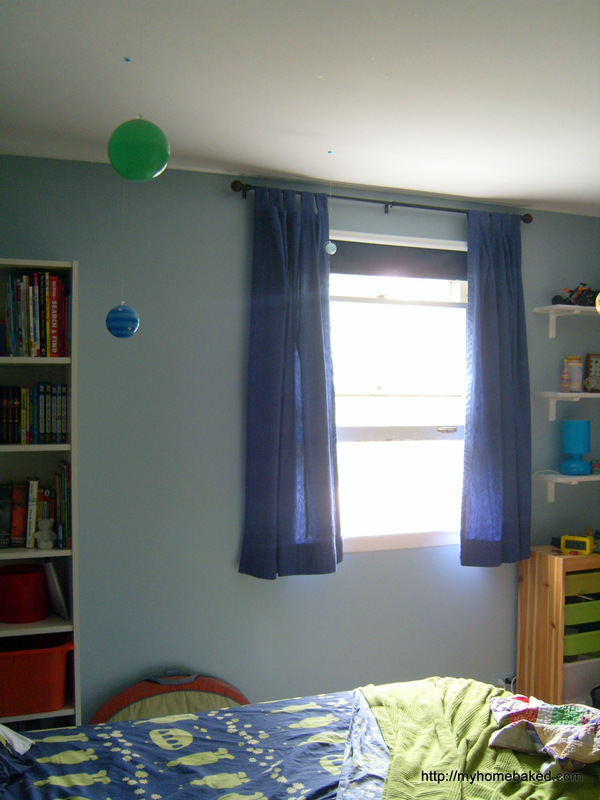 While I was installing the curtain rod today, I was reminded that I still haven’t hung up the artwork or created a new headboard for his room. The trouble is, all these chores and projects at home expand to quite neatly fill whatever time I have to give them. There will always be more yard work, more piles in the basement to sort, and God knows, more laundry. Part of me wants to whip through all the dark pockets of crazy in the house in some kind of organizational frenzy. Part of me thinks I should have done it all last week. Instead, I have tried to spend a little more time each day writing and researching a couple magazine articles. At this stage, with no paycheck in sight, it feels a little illicit, not-quite-real-work, so I assigned myself some deadlines. I even put them on the calendar. I know that if I ever want to earn money writing, I’m going to have to ignore the house for a couple hours. Think of it as a real job, worth the time and discipline. When the kids are home during the day, a routine seems to evolve naturally, as the little tyrants continue to demand food and attention. Now that they’re at school, I’m going to have to create my own priorities. Be my own boss. At least until 3 p.m. The summer is still barreling along at a frantic pace, and I’m only just hanging on. Thursday arrived and I could no longer put off cleaning the house. No time for special projects–just clean the house. Wipe down the bathrooms, vacuum up the cobwebs. It took me all day. I had hoped to break it down throughout the week, but I just wasn’t home. I spent a lot of time in the family room, that ground zero of kid-created disaster. I eradicated the broken crayons, the tiny bits of shredded paper, the Legos, the crumbled half-eaten cereal bars and discarded wrappers and yogurt cups from under the sofa. (And that was just the mess of the past few days.) Then I rearranged the furniture and dragged the old recliner out to the garage (a victim of one too many sessions as a trampoline) to be picked up by a Craigslist reader. After all that, I couldn’t ignore the thick layer of dust on the drapes any longer. I noticed it a couple of months ago, but couldn’t decide what to do. 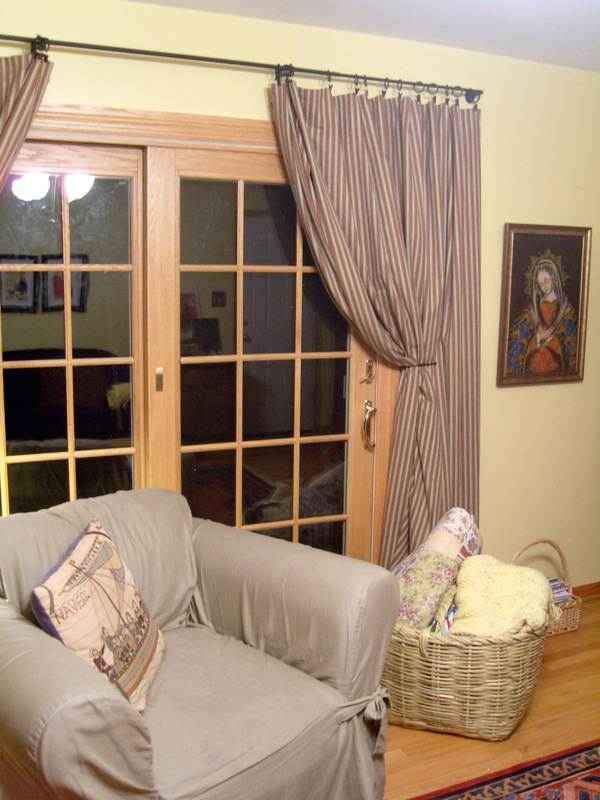 They are the most expensive drapes I’ve ever bought–lined and double-width made to fit our sliding doors. Dry clean? Wash on the delicate cycle and hang to dry? I consulted my mother. She warned me that she has had poor results from both options, and suggested instead tumbling them in the dryer on a cool setting with a couple of dryer sheets. I added a clean, damp towel as well, and used the “extra delicate” temperature setting (one step above “air fluff”). It worked perfectly. Thirty minutes in the dryer for each panel (because they are so big and I wanted to give them enough room to tumble), and I was able to hang them right up without even touching them up with the iron.